BOLIVIABELLA NEWS, Issue #014 -- Help Me Give My Birthday Away! Help me give my birthday away! As promised, I'm sending out November's newsletter AFTER Thanksgiving so I can tell you all about how we celebrated here in Bolivia! Thanksgiving is sort of a mystery here. Those who don’t know US history much find it interesting that the world’s most consumer-based society actually takes time off to give thanks for something. In Bolivia, I began inviting Bolivian friends over for Thanksgiving many years ago so people can see that contrary to popular belief, many Americans actually are grateful for what we have and not all of us use the holiday to watch football or get up at 3 a.m. for “Black Friday door-buster fights… er… sales.” (Black Friday and Cyber Monday do nothing but give the rest of the world an absolutely horrifying opinion of America). Read all about my super thank-packed 2009 Thanksgiving with adopted gringo guests, new and old traditions, and dozens of reasons to be grateful! While we’re on the subject of giving thanks, I want to share another message that came in this week online. Please read Chloe’s story about how a New York teenager learned about gratefulness during a visit to the San Isidro cultural center and street soccer academy in one of Santa Cruz, Bolivia’s poorest neighborhoods. It changed her! It’s great that Americans set aside a special day to give thanks, but you don’t really need to! Make Thanksgiving a part of your DAILY agenda and your life will be better for it!! Don't Miss this in December! My birthday is coming up! And every year I give it away! I do this by asking friends to donate to a charity of my choice rather than purchase gifts for me. This year I’m hoping to donate 100 soccer balls and 100 uniforms to the kids at San Isidro (did you read Chloe’s story above?) See why I’m doing this and how you can help.. If you can help me give my birthday away by donating soccer balls, t-shirts or uniforms in person, please contact me here. If you can donate online, please use the PayPal donate button on the San Isidro page. And while we’re on the subject of traditions, Christmas is coming up. To learn about typical Bolivian Christmas traditions, share yours with us on this page and I’ll link you right to our Christmas in Bolivia page! You’ll also get to read about my memories of crazy mixed up Bolivian/American/German/Norwegian family Christmasses at home (wherever that happened to be at any given time). If you live in Bolivia pre-order your Christmas pumpkin pie, pecan pie or many other gringo baked goodies staring NOW from NutriDiva in Santa Cruz, Bolivia! I also donate 20% of ALL sales from Bella Store to Wanides.org and I do this all year round so if you’re looking for great Bolivia gift ideas, check out my totally new, very unique Bolivia porcelain Christmas ornaments, my brand new Bolivian wildlife 2010 calendar featuring my own all original photographs, and many other great gifts for Christmas and know that your purchase will help wanides.org donate much needed equipment to hospitals in Bolivia. Bolivian handcrafts make AWESOME Christmas gifts too! Our Andean handcrafts sales page features dozens of gorgeous alpaca sweaters, unique jewelry pieces, amazing leather goods and more, all provided by National Geographic. Your purchase helps National Geographic continue its research and education mission, helps keep BoliviaBella online, AND 20% of what Bella earns goes to wanides.org. Your chance to do some triple-good gift giving this year! I’ve also set up a page on my expat website GoSouthExpat.com where you can donate to any one of 40 different projects that benefit the poor in 8 different countries of South America. In my family some members have made it a Christmas tradition to gift to charities on behalf of other friends and relatives. Many families throughout the world have benefitted from these gifts. It’s a great feeling! You can help a poverty-stricken family thrive for as little as $10. See how here. Another great way to give is to give of your time and caring! Bolivia needs volunteers in many areas. If you’re planning a trip to Bolivia or are looking for a great way to spend your vacation while giving to others, learn about our culture, improve your Spanish and take a breath-taking trip all in one, check out my list of organizations in Bolivia that need volunteers! Elections are coming up! On Sunday, December 6th Bolivia will shut down (no transportation – read this page if you are traveling) and Bolivians will go to the polls to elect or re-elect a president and vice-president for the next 5 years. Read our Bolivia news page for information on this. Be sure to check out the Pronto Blog and Mabb Blog, both include political commentary. There is much apprehension in Bolivia now about what this means for the future of (some say end of) democracy in Bolivia. I’ve got 100 brand new Bolivia E-cards for you! Choose from video cards or static cards and add audio to them. A great way to share Bolivia – free! Salteña lovers, I’ve found salteñas for you in the Chicago area. Meet Noly’s Salteñas! BoliviaBella.com and WWF Bolivia the conservation agency are working arduously to bring you new and updated information on Bolivia’s wildlife and what WWF Bolivia is doing to create awareness on climate change. WWF is at work right now creating a whole new section on Climate Change that will be come a permanent and continually updated part of BoliviaBella.com! In addition, BoliviaBella.com is making WWF Bolivia’s children’s magazine about the Pantanal Pandilla Pantanera available for download as each issue comes out! BoliviaBella.com and the Green Hearts Project are also now working on building an entire new section on what this forest reserve project is doing to save Bolivia’s forests for future generations! Be on the lookout for many new changes to this page in 2010. 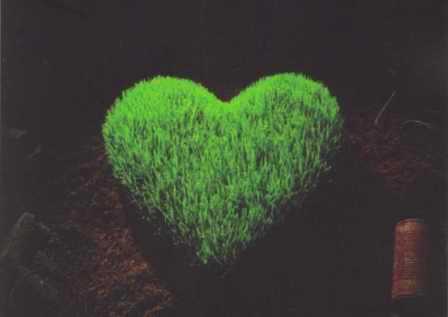 Can you imagine enormous green forest reserves, planted in the shape of enormous green HEARTS, visible from outer space??? You won’t want to miss this – or the chance to participate! We’ll tell you how in future issues! The Chuchini wildlife reserve and refuge 15 minutes from Trinidad in Beni Bolivia needs your help! Read about my visit to Chuchini in May 2009. Chuchini is in desperate need of volunteers at this time. If you would like to volunteer for ANY length of time contact them now on this page. You can work directly with birds and animals if you have experience, but you can also help with forest maintenance, feeding and clean-up or anything else required at this beautiful, now at-risk-of-being-sold wildlife refuge. If you ever wanted to take a pink river dolphin tour on the amazing Amazon, this is your chance to work with the people who started it! Chuchini is also looking for financial help and/or partners! Why is BoliviaBella working so hard with organizations that promote active environmental conservation and climate change mitigation? My friends, it is not a choice any more. There is only one way to live without regret: act! Small but important changes, introduced into our daily living, on a personal and individual basis, is what will create the change we need to face climate challenges our governments have been unable to agree upon. New Year's resolutions are a great place to start!